While it may not be the top of everyone's priority list, buying expandable memory cell phones can go a long way in expanding the functionality and utility of a cell phone. This kind of feature can be very appealing, but it could also make for some added expense as well. Cell phones are used for so much more than just regular voice calls these days. More and more, people are starting to recognize all the other features and functions that can be found within multimedia phones, feature phones, and smartphones that go well beyond calls to Mom and Dad. In particular, most contemporary mobile phones are equipped with digital cameras that are taking better pictures than ever before. Further still, these same phones oftentimes have integrated MP3 players for music playing and video watching, so buying expandable memory cell phones only makes sense. This gives the user added storage capacity for all of these large multimedia files. From Nokia smartphones to Samsung music phones, there are many options when it comes to handsets that have expandable memory card slots. This applies not only to high-end phones too, since more affordable devices are starting to get memory card expansion slots as well. With the memory card slots, it is possible to carry around multiple memory cards for virtually limitless storage capacity on the phone. If you'd like, you can have one memory card loaded with all your personal pictures and music and another memory card for business documents and presentations. This offers a great deal of added versatility, especially if the internal memory is not sufficient for heavier users. It also means that if the memory card should fail, it is much more easily replaced than if the memory was solely of an internal nature. Wouldn't you rather buy a new memory card than take a phone in for repairs? One of the most common iPhone complaints is that the Apple cell phone does not have an expandable memory card slot. This falls in line with the company philosophy that consumers experience through the iPod lineup. No device in the iPod family has a memory card slot and neither does the iPhone. Instead, the iPhone comes with a large amount of internal memory, ranging from 8GB to 32GB of capacity. This is meant to be enough room for all the apps, videos, music, pictures, and other content. The lack of a memory card slot is a point of contention and frustration, but it has not hindered the iPhone's relative success in the marketplace. It quickly skyrocketed into being the smartphone of choice for media-savvy teens and fashion-conscious executives alike. After recognizing the appeal to buying expandable memory cell phones, you may be inclined to jump into the market and buy the first phone that you see. Not so fast! There are a few things that you should know about these phones, particularly the different formats. Just as there are different types of cell phones, there are different types of memory cards as well. Depending on the handset, it may take on a different memory card and you should be cognizant of the relative advantages and disadvantages of each format. By and large, the de facto memory card type of choice is the microSD memory card. Most companies have adopted this format, since the cards are the size of a fingernail and they come in capacities as high as 32GB. 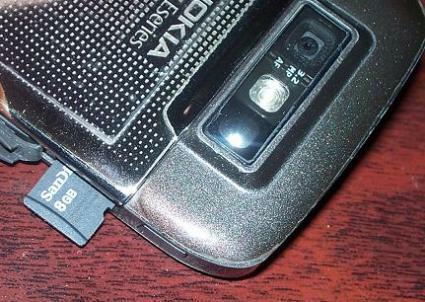 Some Sony Ericsson phones, however, use the Memory Stick Pro Duo format and older smartphones may use miniSD memory cards instead. When buying more memory, be sure to get the right format! Also, some phones may not recognize higher capacity cards, so check with the manufacturer to see the largest capacity that your phone can handle. Some firmware updates may increase this limit.